The prevalence of thyroid dysfunction, including goiter and cancer, is higher in the elderly as compared to the younger population. An excess or deficiency of specific chemical element contents in thyroid parenchyma plays an important role ingoitro- and carcinogenesis of this gland. The variation with age of the mass fraction of twenty elements (Al, B, Ba, Br, Ca, Cl, Cu, Fe, I, K, Li, Mg, Mn, Na, P, S, Si, Sr, V, and Zn) in normal thyroids of 33 females (mean age 54.5 years, range 3.5-87) was investigated. Measurements were performed using a combination of non-destructive and destructive methods: instrumental neutron activation analysis and inductively coupled plasma atomic emission spectrometry, respectively. Tissue samples were divided into two portions. One was used for morphological study while the other was intended for chemical element analysis. This work revealed that there is a statistically significant increase in Al, Br, Ca, Cu, Fe, P, S and Zn mass fraction, as well as a decrease in the Cl mass fraction in the normal thyroids of females during a lifespan. Results of the study showed that for elderly females there is a goitrogenic and carcinogenic association with elevated levels of the thyroid parenchymal chemical elements as Al, Br, Ca, Cu, Fe, and Zn, which increase intra-thyroidal oxidative stress. ROS-Reactive Oxygen Species; ChE-Chemical Elements; CRM/SRM-Certified/Standard Reference Materials; INAA-SLR-Instrumental Neutron Activation Analysis With High Resolution Spectrometry Of Short-Lived Radionuclides; ICP-AES-Inductively Coupled Plasma Atomic Emission Spectrometry; IAEA-International Atomic Energy Agency. The endocrine organs, including the thyroid gland, undergo important functional changes during aging and a prevalence of thyroid dysfunction is higher in the elderly as compared to the younger population [1,2]. Advancing age is known to influence the formation of adenomatous goiter and thyroid cancer . The prevalence of thyroid nodules is increased in the elderly, reaching a frequency of nearly 50% by the age of 65 . Both prevalence and aggressiveness of thyroid cancer increase with age . Women are affected by thyroid nodule and cancer two to five times more often than men [2-5]. Aging is a complex process involving biochemical and morphologic changes in single cells, in organs, and in the whole organism. One of the most generally accepted explanations of how aging occurs at the molecular level is the oxidative stress hypothesis . Reactive Oxygen Species (ROS) are widely considered to be a causal factor not only in aging but in a number of pathological conditions, including carcinogenesis. Aging, considered as an impairment of body functions over time, caused by the accumulation of molecular damage in DNA, proteins and lipids, is also characterized by an increase in intracellular oxidative stress due to the progressive decrease of the intracellular ROS scavenging . Oxidative damage to cellular macromolecules which induce cancer can also arise through overproduction of ROS and faulty antioxidant and/or DNA repair mechanisms . Over production of ROS is associated with inflammation, radiation, and some other factors, including overload of some Chemical Elements (ChE), in both blood and certain tissues, or deficiency of other chemical elements with antioxidant properties [9-15]. Studies have shown that the imbalance in the composition of ChE in appropriate regions may cause different types of pathology. The importance of appropriate levels of many ChE is indisputable, due to their beneficial roles when in specific concentration ranges, while on the other hand they can cause toxic effects with excessively high or low concentrations . In our previous studies [16-24] the high mass fractions of I and some other ChE were observed in the intact human thyroid gland when compared with their levels in non-thyroid soft tissues of the human body. However, some questions about the age-dependence of ChE mass fractions in thyroids of adults and, particularly, in elderly females still remain unanswered. One valuable way to elucidate the situation is to compare the mass fractions of ChE in young adults (the control group) with those in older adults and geriatric thyroids. The other way is to calculate a correlation between age and ChE content in the thyroid. Findings of the excess or deficiency of ChE contents in thyroids of adult and elderly females, may give an indication of their role in the higher prevalence of thyroid dysfunction in the elderly. Reliable data on ChE mass fractions in normal geriatric thyroids is apparently extremely limited. There are many studies regarding chemical element content in human thyroids, using various chemical techniques and instrumental methods [25-45]. However, the majority of these data are based on measurements of processed tissue and in many studies tissue samples are washed before analysis. In other cases, thyroid samples are treated with solvents (distilled water, ethanol etc) and then are dried at a high temperature for many hours. There is evidence that certain quantities of ChE are lost as a result of such treatments [46-48]. Moreover, only a few of the previous studies employed quality Control Using Certified/Standard Reference Materials (CRM/SRM) for determination of the ChE mass fractions. In previously published papers there is no data on the age effects on ChE content of normal human thyroids. Therefore, nondestructive techniques such as instrumental neutron activation analysis with high resolution spectrometry of short-lived radionuclides (INAA-SLR) combined with subsequent, destructive inductively coupled plasma atomic emission spectrometry (ICP-AES) provides a good method for multi-element determination in samples of thyroid parenchyma. This combination of methods provides a possibility to ensure data quality assurance using a comparison of results obtained for some elements by both methods. There were three aims in this study. The primary purpose of the study was to determine reliable values for ChE mass fractions in the normal thyroids of subjects ranging from children to elderly females using INAA-SLR and ICP-AES. The second aim was to compare the ChE mass fractions determined in thyroid gland of age group 2 (adults and elderly persons aged 41 to 87 years), with those of group 1 (from 3.5 to 40 years), and the final aim was to find the correlations between age and ChE contents. All studies were approved by the Ethical Committee of the Medical Radiological Research Centre. Samples of the human thyroid were obtained from randomly selected autopsy specimens of 33 females (European-Caucasian) aged 3.5 to 87 years. All the deceased were citizens of Obninsk and had undergone routine autopsy at the Forensic Medicine Department of City Hospital, Obninsk. Age ranges for subjects were divided into two age groups, with group 1, 3.5-40 years (30.9 ± 3.1 years, M ± SEM, n=11) and group 2, 41-87 years (66.3 ± 2.7 years, M ± SEM, n=22). These groups were selected to reflect the condition of thyroid tissue in the children, teenagers, young adults and first period of adult life (group 1) and in both the second period of adult life and also in the old age (group 2). The available clinical data were reviewed for each subject. None of the subjects had a history of an intersex condition, endocrine disorder, or other chronic disease that could affect the normal development of the thyroid. None of the subjects were receiving medications or used any supplements known to affect thyroid ChE contents. The typical causes of sudden death of most of these subjects included trauma or suicide and also acute illness (cardiac insufficiency, stroke, pulmonary artery embolism and alcohol poisoning). All right lobes of thyroid glands were divided into two portions using a titanium scalpel . One tissue portion was reviewed by an anatomical pathologist while the other was used for the ChE content determination. A histological examination was used to control the age norm conformity as well as the absence of any microadenomatosis and latent cancer. After the samples intended for ChE analysis were weighed, they were transferred to an environment at temperature -20°C and stored until the day of transportation to the Medical Radiological Research Center, Obninsk, where all samples were freeze-dried and homogenized [50-52]. The samples, each weighing about 100 mg, were used for ChE measurement by INAA-SLR. The samples for INAA-SLR were sealed separately in thin polyethylene films washed before hand with acetone and rectified alcohol. The sealed samples were placed in labeled polyethylene ampoules. Biological Synthetic Standards (BSS) prepared from phenol-formaldehyde resins were used as standards . In addition to BSS, aliquots of commercially available pure compounds were also used. After NAA-SLR investigation the thyroid samples were taken out from the polyethylene ampoules and used for ICP-AES. The samples were decomposed in autoclaves. For this 1.5 mL of concentrated HNO3 (nitric acid at 65 %, maximum (max) of 0.0000005 % Hg; GR, ISO, Merck, Darmstadt, Germany) and 0.3 mL of H2O2 (pure for analysis) were added to each thyroid samples, which were placed in one-chamber autoclaves (Ancon-AT2, Ltd., Moscow, Russia) and then heated for 3 h at 160-200°C. After autoclaving, they were cooled to room temperature and solutions from the decomposed samples were diluted with deionized water (up to 20 mL) and transferred to plastic measuring bottles. Simultaneously, the same procedure was performed in autoclaves without tissue samples (containing only HNO3 + H2O2 + deionized water), and the resultant solutions were used as control samples. For quality control, ten subsamples of the certified reference materials (CRM) IAEA H-4 Animal Muscle from the International Atomic Energy Agency (IAEA), and also five sub-samples INCTSBF-4 Soya Bean Flour, INCT-TL-1 Tea Leaves and INCT-MPH-2 Mixed Polish Herbs from the Institute of Nuclear Chemistry and Technology (INCT, Warszawa, Poland) were analyzed simultaneously with the investigated thyroid tissue samples. All samples of CRM were treated in the same way as the thyroid tissue samples. Detailed results of this quality assurance program were presented in earlier publications [54-56]. A horizontal channel equipped with the pneumatic rabbit system of the WWR-C research nuclear reactor was applied to determine the mass fractions of Br, Ca, K, Mg, Mn, and Na by INAA-SLR. The neutron flux in the channel was 1.7 × 1013 n cm-2 s-1. Ampoules with thyroid samples, biological synthetic standards , intralaboratorymade standards, and CRM were put into polyethylene rabbits and then irradiated separately for 180s. Copper foils were used to assess neutron flux. The measurement for each sample was made twice, 1 and 120 min after irradiation. The durations of the first and second measurements were 10 and 20 min, respectively. The gamma spectrometer included the 100 cm3 Ge (Li) detector and on-line computer-based multichannel analyzer system. The spectrometer provided a resolution of 1.9 keV on the 60 Co 1332 keV line. Sample aliquots were used to determine the Al, B, Ba, Ca, Cu, Fe, K, Li, Mg, Mn, Na, P, S, Si, Sr, V, and Zn mass fractions by ICP-AES using the Spectrometer ICAP-61 (Thermo Jarrell Ash, USA). The determination of the ChE content in aqueous solutions was made by the quantitative method using calibration solutions (High Purity Standards, USA) of 0.5 and 10 mg/L of each element. The calculations of the ChE content in the probe were carried out using software of a spectrometer (ThermoSPEC, version 4.1). Information detailing with the NAA-SLR and ICP-AES methods used and other details of the analysis were presented in our previous publication [54-58]. A dedicated computer program for INAA mode optimization was used . All thyroid samples were prepared in duplicate and mean values of ChE contents were used in final calculations. Using Microsoft Office Excel, a summary of the statistics, including, arithmetic mean, and standard deviation, standard error of mean, minimum and maximum values, median, percentiles with 0.025 and 0.975 levels was calculated for ChE contents. The difference in the results between the two age groups was evaluated by the parametric Student’s t-test and the non-parametric Wilcoxon-Mann-Whitney U-test. For the construction of the “age vs ChE mass fraction” diagrams (including trendlines with age) and the estimation of the Pearson correlation coefficient between age and ChE mass fraction the Microsoft Office Excel programs were also used. To identify the trend of the age dependency of ChE contents, we applied approximation methods using exponential, linear, polynomial, logarithmic and power functions. The maximum of corresponding values of R2 parameter, reflecting the accuracy, was of approximation used for the selection of function. The comparison of our results for the Ca, K, Mg, Mn, and Na mass fractions (mg/kg, dry mass basis) in the normal thyroids of females obtained by both NAA-SLR and ICP-AES methods is shown in table 1. Table 2 presents certain statistical parameters (arithmetic mean, standard deviation, standard error of mean, minimal and maximal values, median, percentiles with 0.025 and 0.975 levels) of the Al, B, Ba, Br, Ca, Cl, Cu, Fe, I, K, Li, Mg, Mn, Na, P, S, Si, Sr, V, and Zn mass fractions in normal thyroids of females. The comparison of our results with published data for the Al, B, Ba, Br, Ca, Cl, Cu, Fe, I, K, Li, Mg, Mn, Na, P, S, Si, Sr, V, and Zn contents in the human thyroid is shown in table 3. To estimate the effect of age on the ChE contents we examined the two age groups, described above (Table 4). In addition, the Pearson correlation coefficient between age and ChE mass fractions was calculated (Table 5). Figure 1 shows the individual data sets for the individual Al, B, Ba, Ca, I, K, Li, Mn, and P mass fraction in all samples of thyroid, and also trend lines’ variation with age. Since the age dependency of these element contents was best described by a polynomial function, this approximation was reflected in figure 1. Figure 1: Data sets of individual Ag, Br, Ca, Cl, Cu, Fe, P, S, and Zn mass fraction values in the normal thyroids of females and their trend lines. A good agreement of our results for the Al, B, Ba, Br, Ca, Cl, Cu, Fe, I, K, Li, Mg, Mn, Na, P, S, Si, Sr, V, and Zn mass fractions with the certified values of CRM IAEA H-4 Animal Muscle, INCT-SBF-4 Soya Bean Flour, INCT-TL-1 Tea Leaves, and INCT-MPH-2 Mixed Polish Herbs [54-56] as well as the similarity of the means of the Ca, K, Mg, Mn, and Na mass fractions in the normal thyroids of females determined by both NAA-SLR and ICP-AES methods (Table 1) demonstrates an acceptable precision and accuracy of the results obtained in the study and presented in tables 2-5 and figure 1. Table 1: Comparison of the mean values (M ± SEM) of the chemical element mass fractions (mg/kg, on dry-mass basis) in the normal thyroids of females obtained by both NAA-SLR and ICP-AES methods. M-Arithmetic Mean, SEM-Standard Error of Mean, ∆ =[(M1– M2 )/ M1] *100%. Table 2: Some statistical parameters of Al, B, Ba, Br, Ca, Cl, Cu, Fe, I, K, Li, Mg, Mn, Na, P, S, Si, Sr, V, and Zn mass fractions (mg/kg, dry mass basis) in the normal thyroid of females. M-Arithmetic Mean, SD-Standard Deviation, SEM - Standard Error of Mean, Min-Minimum Value, Max-Maximum Value, P 0.025-Percentile with 0.025 level, P 0.975-Percentile with 0.975 level. Table 3: Median, minimum and maximum value of means Al, B, Ba, Br, Ca, Cl, Cu, Fe, I, K, Li, Mg, Mn, Na, P, S, Si, Sr, V, and Zn contents in the normal human thyroids according to data from the literature in comparison with our results (mg/kg, dry mass basis). M-Arithmetic Mean, SD-Standard Deviation, (n)*-Number of all References, (n)**-Number of Samples. Table 4: Differences between mean values (M ± SEM) of Al, B, Ba, Br, Ca, Cl, Cu, Fe, I, K, Li, Mg, Mn, Na, P, S, Si, Sr, and Zn mass fraction (mg/kg, dry mass basis) in the normal female thyroids of two age groups (AG). M-Arithmetic Mean, SEM-Standard Error of Mean, t-test-Student’s t-test, U-test - Wilcoxon-Mann-Whitney U-test, Statistically significant values are in bold. Table 5: Correlations between age (years) and chemical element mass fractions (mg/kg, dry mass basis) in the normal thyroid of females (r-coefficient of correlation). Statistically Significant Values: ap ≤ 0.05, bp ≤ 0.01, cp ≤ 0.001. The means obtained for Al, B, Ba, Br, Ca, Cl, Cu, Fe, I, K, Mg, Mn, Na, P, S, Si, Sr, V, and Zn mass fraction, as shown in table 3, agree well with the medians of mean values reported by other researches for the human thyroid, including samples received from persons who died from different non-thyroid diseases [25-45]. The mean obtained for Li is two orders of magnitude lower than the median of previously reported data. Moreover, it is outside the range of previously reported means. The mean obtained for V is one order of magnitude higher the median of previously reported data, but it is inside the previously reported range of means. A number of values for ChE mass fractions were not expressed on a dry mass basis by the authors of the cited references. Hence we calculated these values using published data for water 75% and ash 4.16% on dry mass basis contents in thyroid of adults [60,61]. A statistically significant age-related increase in Br, Ca, Cu, Fe, and Zn mass fraction was observed in thyroids of females when the two age groups were compared (Table 4). In the second group of females with mean age 66.3 years the mean of Br, Ca, Cu, Fe, and Zn mass fractions in thyroids were 102%, 116%, 42%, 52%, and 81%, respectively, higher than in thyroids of the first age group (mean age 30.9 years) of females. A statistically significant increase in Ca, Cu and Zn mass fraction with age was confirmed by the Pearson’s coefficient of correlation between age and mass fractions of these elements (Table 5). Moreover, a statistically significant increase in Al, P, and S content accompanied by a decrease in Cl was shown by the Pearson’s coefficient of correlation between age and mass fractions of these elements (Table 5, Figure 1). Thus, both positive (increase with age) and negative (decrease with age) changes were observed for ChE contents in the normal female thyroid. Al, Br, Ca, Cu, Fe, P, S, and Zn are accumulated during lifespan (Figure 1). The increase of Al, Br, Ca, Cu, Fe, P, S, and Zn contents was fast during the first five or six decades, after which the changes in mass fractions of these elements were rather limited. In contrast, the Cl mass fraction showed a progressive slow decrease with age in range from 3.5 to 87 years (Figure 1). According to the authors’ currently available information, no published data referring to age-related changes of Al, B, Ba, Br, Ca, Cl, Cu, Fe, I, K, Li, Mg, Mn, Na, P, S, Si, Sr, V, and Zn mass fractions in female thyroid is available. Aluminum: The trace element Al is not described as essential, because no biochemical function has been directly connected to it. At this stage of our knowledge, there is no doubt that Al overload impacts negatively on human health, including the thyroid function . Bromine: Br is one of the most abundant and ubiquitous of the recognized trace elements in the biosphere. Inorganic bromide is the ionic form of bromine which exerts therapeutic as well as toxic effects. An enhanced intake of bromide could interfere with the metabolism of iodine at the whole-body level. In the thyroid gland the biological behavior of bromide is similar to the biological behavior of iodide . Therefore, at least a goitrogenic effect of excessive bromide level in the thyroid of old females may be assumed. Calcium: In addition to the elevated Br level, an age-related increase and excess in Ca mass fractions in thyroid tissue may contribute to harmful effects on the gland. There are good reasons for such speculations. 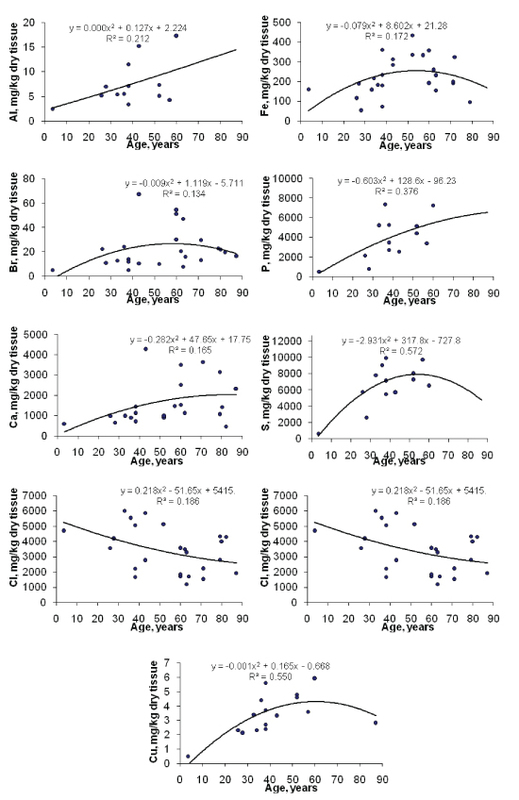 Ca content increases with age in many organs of the human body [64-72]. Except for bone, this natural phenomenon is probably a common occurrence for all organs and soft tissues, and it has links with vascular calcification. Many reviews and numerous papers raise the concern about role of Ca in the prostate, breast, lung and other organ malignant transformation [64-74]. Calcium ions Ca2+ are central to both cell proliferation and cell death . Changes in cytosolic Ca2+ trigger events critical for tumorigenesis, such as cellular motility, proliferation and apoptosis .An increased growth rate of cells is correlated with an increase in the intracellular calcium pool content [64,65]. Moreover, increases in cytosolic free Ca2+ represent a ubiquitous signaling mechanism that controls a variety of cellular processes, including not only proliferation, but also cell metabolism and gene transcription . Indeed, an increased level of Ca content in the thyroid tissue of elderly females reflects an increase in the intracellular calcium pool. Thus, an increase of Ca content in tissue and organs with age is a key feature in the etiology of many benign and malignant tumors, including thyroid goiter and cancer. Chlorine: Cl is a ubiquitous, extracellular electrolyte essential to more than one metabolic pathway. Cl exists in the form of chloride in the human body. It is present mostly as sodium chloride in the extra cellular fluid. Therefore, usually, in normal conditions there is a correlation between Na and Cl contents in tissues and fluids of the human body (Table 6). Why Cl content in normal female thyroids decreases with age and how it acts on the thyroid are still to be fully understood. Copper: Cu, like Fe and Zn, is also a ubiquitous element in the human body which plays many roles at different levels. Various cupro enzymes (such as amine oxidase, ceruloplasmin, cytochrome-c oxidase, dopamine-monooxygenase, extracellular superoxide dismutase, lysyl oxidase, peptidylglycine amidating monoxygenase, Cu/Z nsuperoxide dismutase, and tyrosinase) mediate the effects of Cu deficiency or excess. Cu excess can have severe negative impacts. Cu generates oxygen radicals and many investigators have hypothesized that excess copper might cause cellular injury via an oxidative pathway, giving rise to enhanced lipid peroxidation, thiol oxidation, and, ultimately, DNA damage [75-77]. Thus, increasing Cu overload in thyroid parenchyma with age may be involved in oxidative stress, dwindling gland function, and increasing risk of goiter or cancer. Iron: Fe is an essential element for humans, but the beneficial Fe concentration window is narrow. Many recent studies have highlighted adverse effects of Fe overload. Fe overload has been documented in genetic diseases (e.g. hemochromatosis and thalassemia), Excessive Fe over-supplementation (especially in the case of chronic renal failure), or increased Fe serum level due to cessation of menstruation in postmenopausal women can be deleterious. An age-related increase and excess in Fe mass fractions in thyroid tissue may contribute to harmful effects on the gland. There are good reasons for such speculations since many reviews and numerous papers raise the concern about toxicity and tumorigenesis of Fe. Indeed, Fe overload may be involved in oxidative stress, dwindling thyroid function, and increasing risk of goiter or cancer . Phosphorus: P is necessary for several, various biological roles in the signal transduction of cells and energy exchange of human body. About 80%-90% of phosphorus is founded in teeth and bones in the form of hydroxyapatite. Elevated serum inorganic phosphorus is suspected to increase the risk of chronic kidney disease, cardiovascular disease through vascular calcification, myocardial fibrosis, and development of left ventricular hypertrophy . In both males and premenopausal females, serum phosphorus levels decline progressively with age. In males, the decline continues over the entire age range of 21-85 years. In contrast, in females, serum phosphorus levels rapidly increased after the menopause. The increase in serum phosphorus levels in older women is independent of changes in serum parathyroid hormone levels, daily dietary phosphorus intake, and estimated glomerular filtration rate . Calcium phosphates are one of the main constituents of mineral deposits in aortic wall . Thus, the high P level in thyroid parenchyma of elderly females can be intimately linked with vascular calcification. How the elevated P level affects thyroid function and its role in goiter and carcinogenesis have to be studied in the future. Sulfur: S is available to humans in their diets, derived mainly from proteins, and yet only 2 of the 20 amino acids normally present in proteins contains sulfur-methionine and cysteine. One of these amino acids, methionine, cannot be synthesized by our bodies and therefore has to be supplied by the diet. Proteins contain between 3 and 6% of sulfur amino acids. Sulfur amino acids contribute substantially to the maintenance and integrity of the cellular systems by influencing the cellular redox state and the capacity to detoxify toxic compounds, free radicals and reactive oxygen species . ROS are generated during normal cellular activity and may exist in excess in some pathophysiological conditions, such as inflammation. Therefore exploring fundamental aspects of sulfur metabolism such as the antioxidant effects of sulfur-containing amino acids may help elucidate the mechanism by which the S content in the female thyroid increases with age . Thus, it might be assumed that the elevated S level in thyroids of elderly females reflects an increase in concentration of ROS in female thyroid parenchyma at an age of about 60 years and above. Zinc: Zn is active in more than 300 proteins and over 100 DNAbinding proteins, including the tumor suppressor protein p53, a Znbinding transcription factor acting as a key regulator of cell growth and survival upon various forms of cellular stress. p53 is mutated in half of human tumors and its activity is tightly regulated by metals and redox mechanisms. On the one hand, Zn ions are cofactors of the superoxide dismutase enzymes, which prevent the onset and progression of tumors through cell protection against substances that cause the formation of free radicals and ROS. The role of zinc is to act as a membrane stabilizer and to participate in antioxidative protection and oxidative stress inhibition. Therefore, the elevated Zn level in thyroid of elderly females may reflect an increase in inflammation of female thyroid parenchyma at age about 60 years and above. From the other hand, excessive intracellular Zn concentrations may be harmful to normal metabolism of cells . By now much data has been obtained related both to the direct and indirect action of intracellular Zn on the DNA polymeric organization, replication and lesions, and to its vital role for cell division [85-87]. Moreover, it is known that Zn is an inhibitor of the Ca-dependent apoptotic endonuclease, which takes part in the internucleosomal fragmentation of DNA. Consequently there is a reduction of cell apoptosis . Other actions of Zn have been described. They include its action as a potent anti-apoptotic agent [89-92]. All these facts imply that agerelated overload Zn content in female thyroid is probably one of the factors in etiology of goiter and carcinoma. Thus, if we accept the levels of ChE mass fraction in thyroid glands of females in the age range up to 40 years as a norm for all ages, we must conclude that after age 40 years the Al, Br, Ca, Cu, Fe, P, S and Zn contents are significantly higher than normal levels. Elevated levels in thyroid parenchyma, for at least such elements as Al, Br, Ca, Cu, Fe, and Zn may contribute to harmful effects on the gland. Our data elucidate that there is a statistically significant increase in Al, Br, Ca, Cu, Fe, P, S and Zn mass fractions, as well as a decrease in Cl mass fractions in the normal thyroids of females during a lifespan. Elevated levels for at least such elements as Al, Br, Ca, Cu, Fe, and Zn in the thyroids of elderly females increase intra-thyroidal oxidative stress and, as consequence, risk of goiter and malignant transformation. Goiter and thyroid cancer are multi etiological and multi factorial complex diseases. The complete understanding of the role of inadequate levels of some chemical elements in thyroid parenchyma in the etiology of goiter and carcinoma requires a global vision of their different mechanisms of action, which is not yet possible with the present state of knowledge. However, from results of our study, a goitrogenic and carcinogenic effect of elevated Al, Br, Ca, Cu, Fe, and Zn levels in the thyroids of elderly females is shown to be a very likely consequence. We are grateful to Dr. Yu. Choporov, Head of the Forensic Medicine Department of City Hospital, Obninsk, for supplying thyroid samples. We are also grateful to Dr. Karandaschev V, Dr. Nosenko S, and Moskvina I, Institute of Microelectronics Technology and High Purity Materials, Chernogolovka, Russia, for their help in ICP-AES analysis. Zaichick V (1998) Iodine excess and thyroid cancer. J Trace Elem Exp Med 11: 508-509. Zaichick V (1998) In vivo and in vitro application of energy-dispersive XRF in clinical investigations: experience and the future. J Trace Elem Exp Med 11: 509-510. Zaichick V, Iljina T (1998) Dietary iodine supplementation effect on the rat thyroid 131I blastomogenic action. In: Anke M, et al. (eds) Die Bedentung der Mengen- und Spurenelemente. 18. Arbeitstangung. Friedrich-Schiller-Universität, Jena, 294-306. Zaichick V (1999) Human intrathyroidal iodine in health and nonthyroidal disease. In: Abdulla M, et al. (eds) New aspects of trace element research. Smith-Gordon and Nishimura, London and Tokyo, 114-119. Zaichick V (2000) Relevance of and potentiality for in vivo intrathyroidal iodine determination. In: Yasumura S, et al. (eds) In Vivo Body Composition Studies. Ann. N. Y. Acad. Sci 904: 630-632. Kortev AI, Dontsov GI, Lyascheva AP (1972) Bio-elements in human pathology. Middle-Ural publishing-house, Sverdlovsk, Russia. Kamenev VF (1963) Trace element contents in the thyroid gland of adult person. In: Trace elements in agriculture and medicine. UlanUde, Russia, 12-16. Reytblat MA, Kropacheyv AM (1967) Some trace elements in the normal thyroid of Perm Prikam’e inhabitants. Proceedings of Perm Medical Institute 78:157-164. Neimark II, Timoschnikov VM (1978) Development of carcinoma of the thyroid gland in person residing in the focus of goiter endemic. Problemy Endocrinilogii 24: 28-32. Zakutinskiy DI, ParfeynovUyD, Selivanova LN (1962) Handbook on the toxicology of radioisotopes. State Publishing House of medical literature, Moscow. Remis AM (1962) Endemic goiter and trace elements in KabardinoBalkaria. In: Proceedings of the fifth congress of Northern Caucasia surgeons. Rostov-on-Don, 276-278. Novikov GV, Vlasova ZA (1970) Some organism functions in connection with the iodine content in human diet and experimental animal fodders. In: Biological role of trace elements and their use in agriculture and medicine, Vol. 2. Nauka, Leningrad, 6-7. Bredichin LM, Soroka VP (1969) Trace element metabolism in patients with thyroid goiter under treatment. Vrachebnoe Delo 51: 81-84. Zaichick V (1997) Sampling, sample storage and preparation of biomaterials for INAA in clinical medicine, occupational and environmental health. In of: Harmonization Health-Related Environmental Measurements Using Nuclear and Isotopic Techniques. IAEA, Vienna, 123-133. Zaichick V (2004) Losses of chemical elements in biological samples under the dry ashing process. Trace Elements in Medicine 5: 17-22. Zaichick V, TsislyakYu V (1978) A simple device for bio-sample lyophilic drying. Lab Delo 2: 109-110. Zaichick V, TsislyakYu V (1981) A modified adsorptive and cryogenic lyophilizer for biosample concentrations. Lab Delo 2:100-101. Zaichick V, Zaichick S (2014) Determination of trace elements in adults and geriatric prostate combining neutron activation with inductively coupled plasma atomic emission spectrometry. Open J Biochem 1: 16-33. Korelo AM, Zaichick V (1993) Software to optimize the multielemental INAA of medical and environmental samples. In: Activation Analysis in Environment Protection. Joint Institute for Nuclear Research, Dubna, Russia, 326-332. Copyright: © 2018 Zaichick V, et al. This is an open-access article distributed under the terms of the Creative Commons Attribution License, which permits unrestricted use, distribution, and reproduction in any medium, provided the original author and source are credited.